It doesn’t feel right to classify this book as a “favorite,” as its subject is so horrifying and its treatment is so detailed that, frankly, it’s not an easy read. 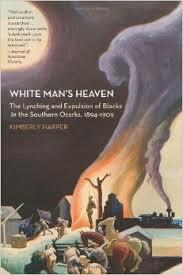 But White Man’s Heaven: The Lynching and Expulsion of Blacks in the Southern Ozarks, 1894-1909 is definitely a book to be read and reckoned with. The book draws on copious original sources — testimony, newspaper accounts, witness reports, court records, and more — to detail the circumstances and aftermath of lynchings in the Missouri towns of Pierce City, Joplin, and Springfield, and the Arkansas town of Harrison, to portray the life and racial situation of the time. It’s a grisly picture, one from which author Kimberly Harper does not flinch. The story repeats itself in town after town: a crime that excites racial antagonism, public officials who are either indifferent or sympathetic to the mob, a lynching in the town square and the subsequent intimidation of the rest of the black population. In reading these accounts, what struck me was the pervading and casual racism of the time. But it shouldn’t have come as a surprise, because I remember the Ozarks of my youth, seventy years later, as a place where racist attitudes were openly and casually expressed. When I was young, I took the whiteness of the Ozarks for granted. It was simply a condition of the locale. But after reading White Man’s Heaven, I realize that the racial homogeneity of the Ozarks was not a natural condition, but an enforced one, in which entire towns were depopulated of their African-American population, often through violent means. The word “pogrom” comes to mind. This book is not one to be read for pleasure, but it’s a valuable read. It was published by the University of Arkansas Press, but for some reason when I do a search on the UAP website, it comes up “not found.” It’s available elsewhere, though.